Interested in teaching your young child other languages? 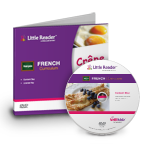 Now you can with the Language Curriculum Packs for Little Reader. These curriculum packs will help you teach your young child to recognize thousands of new words, understand their meanings, and learn to speak a different language. Semester 1 & 2: 12 months' worth of lessons in a language you choose! Each word file adheres to BrillKids standards, and comes with 3 professionally recorded voices, 3-5 quality images, 2-4 picture audio (word commentaries or sound effects) and - to help better illustrate things and concepts such as animals, action words and stories - 3 videos! Fully customizable lessons progress from single words all the way to complete stories. Using Little Reader's Pattern Phonics™ system, your child will also be guided to decode the written language in an intuitive manner, setting a solid foundation for learning the language further in the future. You need a licensed Little Reader to use this product. Little Reader software sold separately.